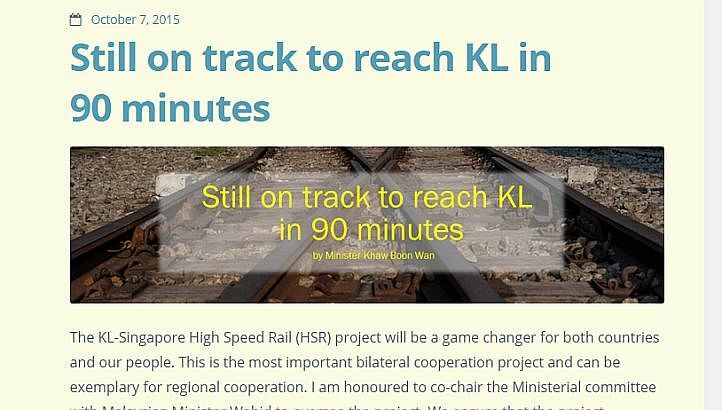 SINGAPORE - A request for information (RFI) for the Singapore-Kuala Lumpur high-speed rail (HSR) was issued by the governments of both countries on Wednesday (Oct 7) - marking a new milestone for the joint project. The Land Transport Authority (LTA) and Malaysia's Land Public Transport Commission (SPAD) said in a joint announcement that the market sensing exercise will gauge market interest and gather industry opinions on commercial and technical aspects of the project. "The feedback received will inform the ongoing bilateral discussions and formal tender process subsequently," both parties said in a press release. In a blog post, Transport Minister Khaw Boon Wan said the joint project was "still on track" but he acknowledged the challenges which lay ahead. "It is a large, complex infrastructure project, and there are many examples of countries that have failed in their HSR aspirations or their HSRs have run into serious financial problems," he wrote. Mr Khaw said this is due to a "gulf" between the countries' ambitions and the market realities. "This market sensing exercise is intended to close that gulf," he added. The RFI exercise is expected to conclude by the end of the year. The Singapore-KL HSR was first announced by Prime Minister Lee Hsien Loong and his Malaysian counterpart Najib Razak in 2013. With terminus stations in Kuala Lumpur's Bandar Malaysia and Singapore's Jurong East, the HSR link is expected to cut the travel time between the two cities to 90 minutes. According to details published on the LTA's website, the RFI is open to companies or consortiums interested in participating in the project in the areas of design, funding, construction, operations and maintenance. Others with experience in large and complex infrastructure projects, preferably in the area of HSR, are also welcome.